Welcome to Earth, third rock from the sun! Wait.....that's not Earth. And it's not a rock. What am I Trying to do? Make it look like I'm stupid? I decided a long time ago I didn't need any help in doing that...I can look stupid without any help from myself. I used the Latin spelling for Jupiter. Jupiter is a planet in our solar system. It is big. It is made up of gas, but not the kind of gas daddy uses in his truck. People can not go to Jupiter because there is no air for them to breathe. They would all die and be sad. 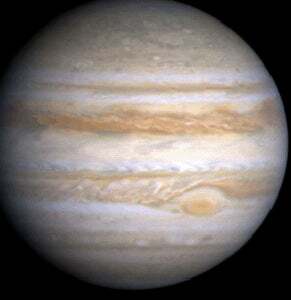 Jupiter is the biggerest of all the planets in the solar system. Ok....enough of that. I asked a couple of elementary students what they knew about Jupiter, and that is what they said. And, yes, the word 'biggerest' was used. I was looking for an entertaining way to introduce todays subject, and I though, "Hey....kids....". So, todays subject is Jupiter. Specifically, what Jupiter is made up of on the inside. We can't see, and we can't go there, so we can only speculate. And astronomers speculate there might be a rocky core somewhere inside Jupiter. Or there might not. They just don't know. What they do know is, Jupiter is made up entirely, (or almost entirely), of gas. And they're pretty sure the rocky core, if there is a rocky core, is surrounding an inner core of metal. There's just one problem with that; There is no metal on Jupiter. None. Nada. Zero. Zilch. Yet, they're confident the inner core is made up of liquid metal. I know what you're thinking; "how can there be liquid metal if there's no metal?". Who knows what the Periodic Table is? It's the chart that shows all the elements discovered by science so far. It has them ordered in different ways. In rows by their Atomic Number, (number of protons in the nucleus), and in columns by their properties. The columns also tell you how many electrons are in the outer shell of the atom. Woah! Wait a minute......there's a maximum of eight electrons in a shell, but there's 18 columns in the Periodic Table, Otter! You got some 'splainin' to do! The extra columns comprise what it knows as "D-Block". There are the transitional metals. And.....that's as far as I'm going in this explanation. And that's because the history of the Periodic Tablet is a long story which I don't care to repeat here. However, if you are interested, reading about Newlands 'Rule of Octaves' and how Mendeleev came up with the basis for the current model is quite.....um....not boring? And, you'll recall I said the columns were sorted by elements that share properties. So, why is hydrogen in the same column with metals? When subjected to 25GPa, (that's 25 Gigapascal's, or the equivalent to 250,000 atmospheres, or 3,500,000 psi), hydrogen atoms would begin to lose their hold on their electrons and take on metallic properties. It would also become electrically conductive. The pressure needed to do this, though, are in the extreme. We haven't been able to do it yet in a lab. The only place where it's thought to happen in in the core of Jupiter and Saturn, and some of the larger exo-planets that have been discovered. That's because the only thing we know of right now that can produce that kind of pressure is gravity. And gravity is proportional to the mass of the object. Bigger mass, more gravity. More gravity, more pressure at the center. Now, transformative changes in the elements aren't new. Look at oxygen. It's a gas in it's 'normal' state, but can turn into a liquid under pressure. Combine hydrogen and oxygen, both gasses, and you get water, a liquid. Subject the liquid to cold, and you get a solid. Subject it to heat, and you get a gas again. But Metallic Hydrogen is something special. In fact, scientists call it "The Holy Grail of High Pressure Physics". So, stay tuned boys and girls. Someday, all our gasses will be solids.....or.....something. I don't know.